The System Editor is an advanced, yet intuitive development tool for managing all of your engine maps, calibrations and setups. Management of engine maps is simplified by organizing features into Function Groups. Each group contains the various Maps, Tables and Constants that define how each engine control function operates. 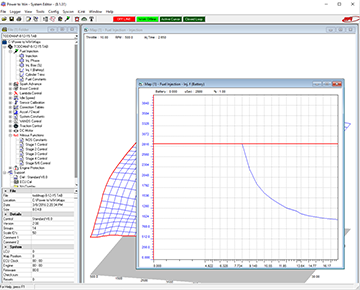 Engine calibrations are managed using the system file folder window that displays the current map structure and its contents. Engine calibration data can be displayed and edited in either graphic or numeric formats. Any combination of maps can be loaded simultaneously to the main window. 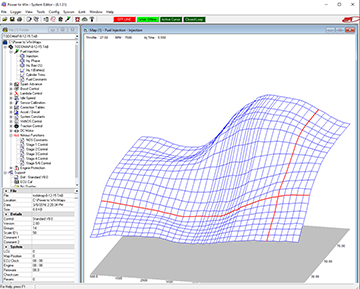 In addition, any of the 3 dimensional maps can be rotated or tilted to change the perspective of the graph. If your ECU has been configured with an internal data logger you can configure the ECU to record engine data and then download this data to disk. 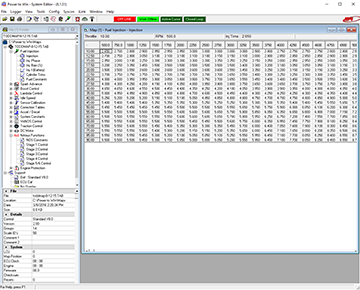 Once downloaded, the data can be viewed with the Analysis program. Engine data can be monitored in real-time using the data controls window. 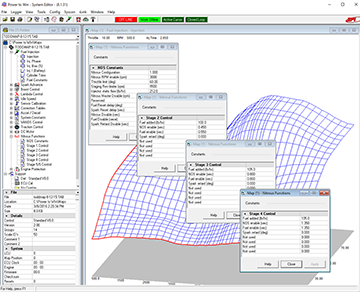 The user can select from a variety of display types to best visualize each engine channel. The message center displays program status information, diagnostic error codes, lambda control data and provides access to the self learn table and settings. This feature allows realtime ECU data to be sent to a remote location over the internet allowing EFI personnel to monitor your ECU, check engine sensors, read diagnostic codes, view your engine map and more.